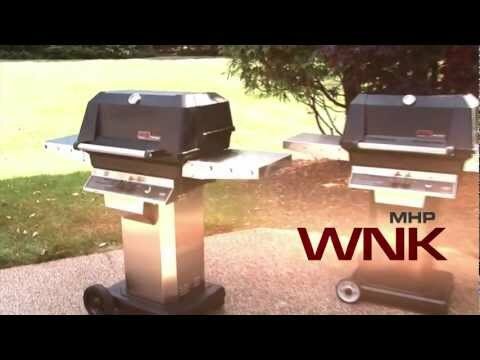 This MHP hybrid gas grill has a high profile, thick, cast aluminum no rust exterior housing that accommodates large cuts of meat and features a Sta-Kool handle which rolls to make opening the hood easy. The 433 inches of cooking are and 48,000 BTUs offer superior cooking performance. Includes two cast stainless steel oval burners with flavor plates and one ceramic infrared gas burner with individual temperature controls provide multiple cooking zones offering flexibility when cooking. The FlavorMaster long lasting porcelain briquettes provide constant precisely controlled heat and true barbeque flavor. The anodized aluminum SearMagic cooking rack is reversible with one side wide-ribbed for grilling steaks, chops, burgers or ribs and giving them sear lines. Flip it over and its smooth surface is perfect for fish, vegetables or even breakfast foods such as French toast. Includes black, aluminum column and black, cast aluminum base with 8 inch wheels and locking casters. Includes 12ft hose with quick disconnect coupler, two (2) stainless steel side shelves and stainless grease cup for easy clean-up. Some assembly required for this MHP BBQ Grill. Easy to assemble. Instructions clear & concise. I live beachside, so the cast aluminum,stainless, & plastic components ensure long life in spite of the elements. To extend product life, I bought the full length cover. 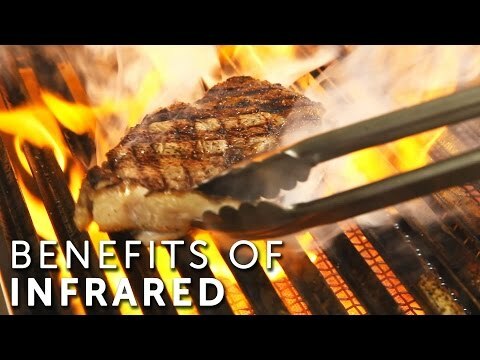 I like the infared burner and use it every time I grill. Hybrid burner really heats fast, sears fast. I've never had juicier meat! Assembly directions were clear and simple, unlike the last grill I put together nearly 20 years ago (a Charbroil). I decided on this grill because it has drop-down shelves, which VERY FEW grills offer. My only complaint is the large, ugly text cast into the grill lid--"FOR OUTDOOR USE ONLY" on one side and "OPEN BEFORE LIGHTING" on the other. 24 X 15 3/4" 22 3/8 X 18" 26 1/4 X 19" 25 7/8 X 17 1/4"